Commercial junk removal services by 1-855-F'IN-JUNK. 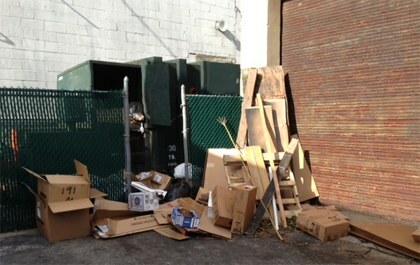 Some boxes, palletes, scrap wood, and other business waste before haul-away. When you're running an business, junk is just a fact of life. There's packing material, paper waste, old office furniture, and much more. And it can stack up fast. 1-855-F'IN-JUNK makes it easy to get rid of those trash and recyclables all at once, with just one call! Our junk removal trucks pickup onsite right at your office or place of business. If you've got large items like old desks, cabinets, or other office furniture, you don't even have to haul it out to the loading dock - we can come in and haul it out. So give us a call or send a message online, and you'll see why 1-855-F'IN-JUNK junk removal service for business is the smart choice! 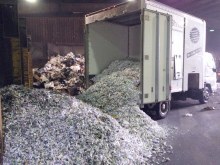 SafetyShred is the paper shredding and recycling division of 1-855-F'IN-JUNK. SafetyShred is a mobile document destruction company providing the most secure, efficient, simple and cost effective plan for destroying your confidential information. Security and service are our highest priorities. 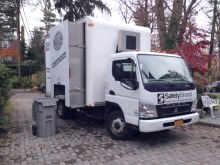 SafetyShred is a local owned based company providing on-site mobile shredding at your home or business. Our company comes to your location and shreds your documents on-site. We will remove your documents to be shredded to our truck located outside your facility and provide you with a certificate of destruction upon completion. SafetyShred is family owned and operated. We are committed to building lasting relationships with our customers. We take the time to meet you and answer all of your questions. Its important to us that you are 100% comfortable with our service. Licensed, bonded, insured and also in compliance. SafetyShred is licensed, bonded, insured and also in compliance. We as owners are also the field technicians and are security screened to ensure you receive professional service with every visit to your home or business. SafetyShred is a full service paper shredding and media destruction company that maintains compliance with privacy legislation. We are committed to providing our customers with a highest standards of security. When using us for all your shredding needs, its important that you know what we stand for. SafetyShred will tailor a service plan to meet your requirements. We pride ourselves on being agile and innovative, focused on maintaining long-term relationships with our customers. Our process is designed to fit your specific demand and is altered when your needs change. We offer a service plan that is affordable and geared towards your needs. Don't throw out your old files or use a store bought shredder. Calling us will give you that extra security. We come to you and shed on site. You can view your documents as they are being destructed on our curb side monitor.